Some of our truly high volume customers (you know who you are) discovered a performance degradation in EJBCA when trying to upgrade to EJBCA 6.9 and later a few months back. Sadly this was nothing we discovered ourselves as we normally don't test at such high volumes, and neither do most of our customers. Testing and diagnostics showed that this degradation has been gradual over the course of a couple of years. With EJBCA 6.10.1 we have put a ton of effort into profiling and optimizing, and while we're not yet fully back to previous levels we're at least within parity, and we still have some improvements to make. Most of you don't produce the volumes of transactions where you'd notice the difference, but for those of you that would EJBCA 6.10.1 can perform double the throughput in comparison to EJBCA 6.10. In order to avoid similar degradations in the future we've also added a performance testing project to our CI environment with weekly monitoring. 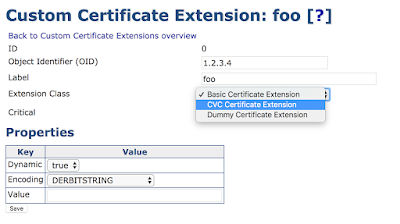 Another new feature introduced in EJBCA 6.10.1 (for Enterprise customers only) is the addition of custom certificate extensions for CV certificates as well. 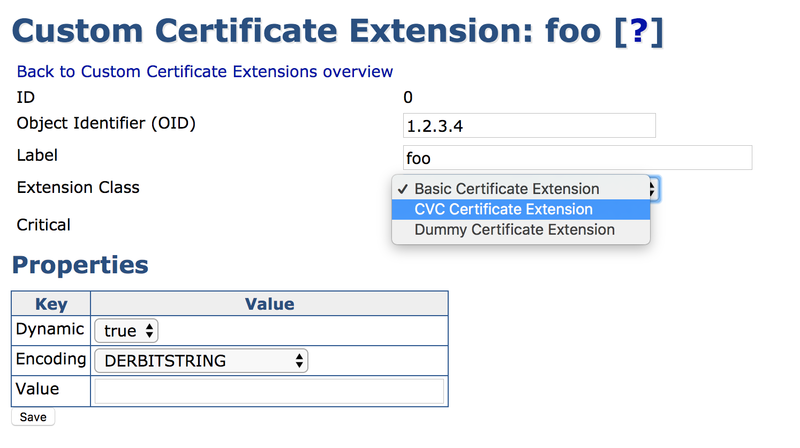 Setting them up is done as usual under System Configuration → Custom Certificate Extensions. Writing to an n number of CT logs is not sufficient, but at least one of these logs must be one of the Google CT logs. The minimum number of logs to be written to should be defined by the validity time of the certificate. Performance requirements by CAs require that writing to n logs in the quickest manner possible takes precedence over log order. We made a small improvement back in EJBCA 6.10.0 in which we introduced the concept of "mandatory" logs in order to solve the first requirement. The contract that these labels infer is that at issuance time, at least one log from each label will be written to (satisfying requirement 1), and given that constraint the other logs will be written to in parallell and the first n SCTs received in reply will be used in the certificate, optimizing issuance time and satisfying requirement 3. Naturally, you'll notice that individual logs have instead been replaced by labels. The min/max setup from previous versions still remains, but we've added the By Validity-option, which instead sources the sought value from the previously show table att issuance time. So that's it for now for us. We've been working on EJBCA 6.11 in parallell to this release, so you can expect to see it come out quite shortly. Any feedback on our CT implementation would be greatly appreciated, as we still have plenty of time to amend it before April. So, we've heard that a lot of you have been having trouble with upgrades, so we've made an effort to both explain and make the process way easier. Yeah, we know. You can stop laughing now. Really. We've done better this time, we promise. Description: During EJBCA 6.8.0 we refactored the roles and access rules massively, which lead to an upgrade break when upgrading from versions of EJBCA prior to 5.0 (though upgrading via EJBCA 5.0 was still possible). As we realized that solving this issue while preserving 100% uptime requirements (see below) was impossible, as well as due to the technology jump (see the next section) and bugs that we discovered while testing upgrading from ancient installations, we created EJBCA 6.3.2.6 in order to handle all the intermediate steps. As of today EJBCA 6.3.2.6 is published and available in the Community Edition on SourceForge, and in the download area for customers. Description: All good things must come to an end, as must support for legacy runtime versions. As much as we value not having to put our customers through unnecessary hoops by forcing them to upgrade underlying technology such as the JDK, at some point we have to drop support due for several reasons: being held back by not being able to use modern developments, because other dependent systems like Application Servers drop support as well and because the JDKs themselves come to the end of their service lives and will no longer receive support from the vendor. In EJBCA 6.4.0 we decided to move on to JDK7, which means that it can no longer be deployed to application servers based on JDK6 such as JBoss versions 4 and 5. The latest version that can still run under JDK6 is EJBCA 6.3.2.6. 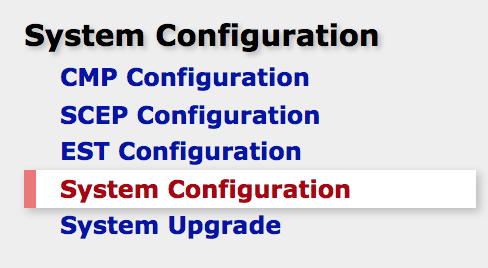 For an upgrade path this means that you can continue running on your old JBoss 5.1.0.GA server (JEE5) up to, and including, the EJBCA 6.3.2.6 intermediate release. 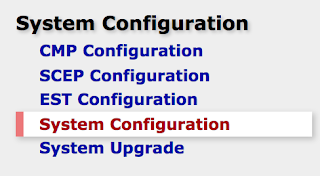 At this stage you must upgrade JDK and the application server, suggestedly to JDK8 and JBoss EAP 7 or WildFly 10. Description: While this may be familiar to many of you, EJBCA has ever since version 4.0 supported full uptime during upgrades for clustered installations. What this means is that we pledge that a clustered installation can continue to sign certificates, issue CRLs and answer OCSP queries during the upgrade process with no noticeable downtime for the end user. Description: Stunningly, prior to EJBCA 6.4.0 we hadn't actually thought of tracking the database version internally, thus requiring our user to manually enter this value. From EJBCA 6.4.0 and later we do in fact track this, doing away with the need to run the upgrade command entirely. Instead, it'll be automatically run from the first node running the upgraded code.